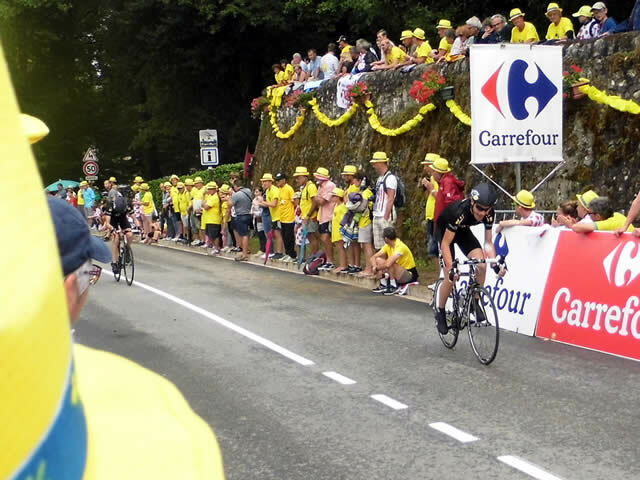 We had never seen the Tour de France live before so with it passing through the Perigord it was a chance that we could not miss. The day started off badly with the forecast stating that a storm was due. Being in a positive mood I made a picnic hamper! The storm hit on route to Monbazillac and what a storm it was thunder, lightning, torrential rain. We could just see the car in front of us. As I said, being in a positive mood we carried on thinking that the storm would pass by in time for riders. Oh contraire, the storm did stop for about an hour then it started again, stronger and more violent than before. 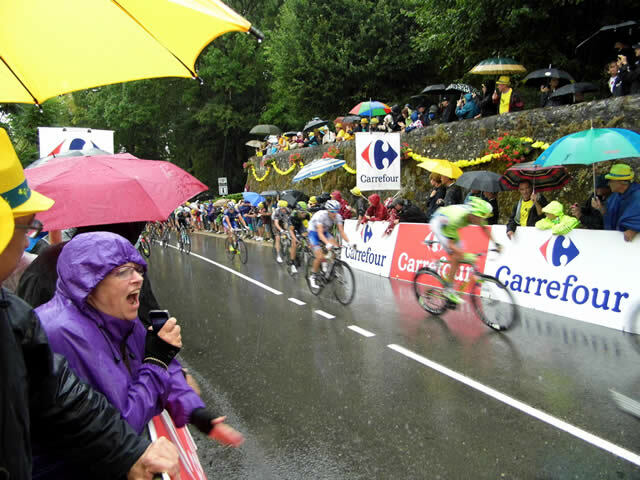 However, this did not put us off, we stayed for the race, and four hours of waiting in the storm was worth it just to see the riders pass by. 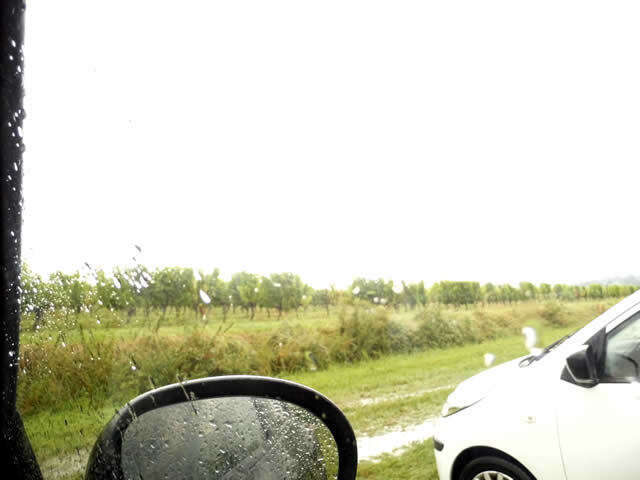 We arrived at Monbazillac and parked in a soaked piece of land between two vineyards and ate our picnic, while watching the thunder and lightning getting nearer and nearer. Guess who had only sandals on her feet that day? Waiting for so long we became friends with the people next to us on either side, sharing umbrellas, sweets etc. First was the junior race, the rider in front went back for the second rider to help him to finish the race. Then came the time that everyone was waiting for, the caravan. 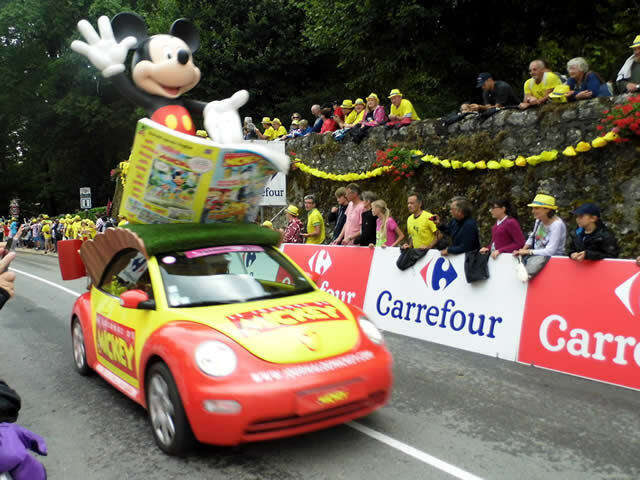 This is a series of cars and floats who speed pass throwing sweets, cakes, hats, drinks, toys etc. 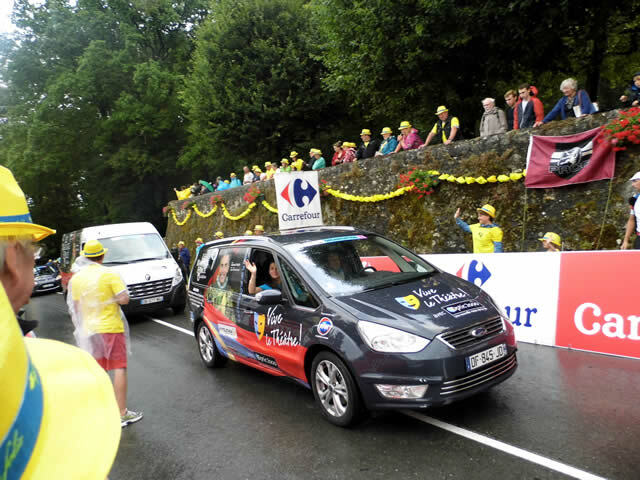 The caravan was an amazing sight, you can just see the very large rider in a yellow jersey on top of the car. Everyone cheered; we put our hands up for the sweets but missed this time. 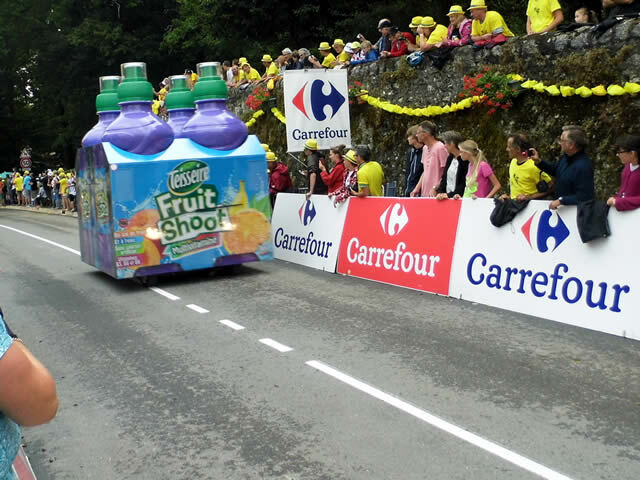 When the junior bike riders and caravan had driven past we had to wait for about an hour or so. Then the the crowed cheered loudly because we could all hear the helicopter over our heads, the race was here. 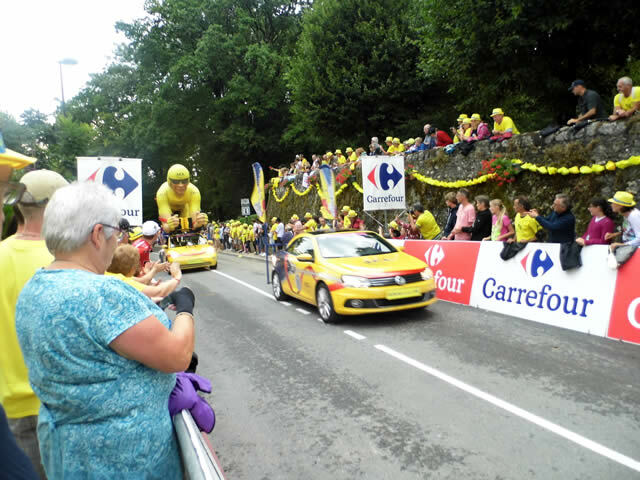 These are the first riders, it was so exciting, people shouted, banged on the side of the barrier, some people called out the names of the riders while others just stood in awe. It was great and truly a sight worth waiting for. 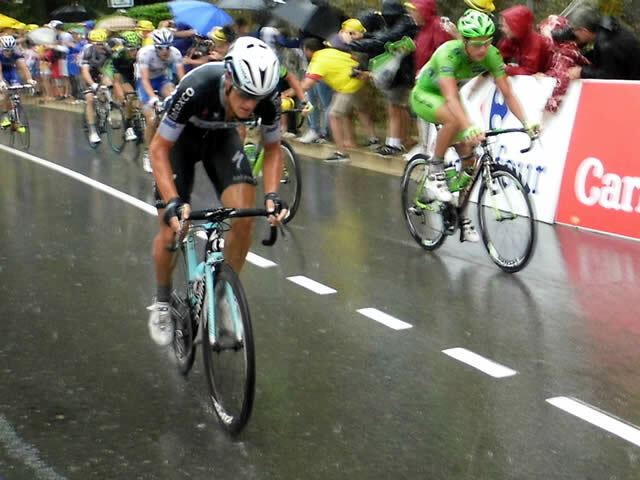 This is the peloton, the pain on the rider’s faces as they fought to finish the stage. They had come so far, endured every type of weather and physical and mental torture, they were truly awe inspiring. Would I do it again? Yes, yes, and yes but next time I must remember to pack my Wellington boots.